November 10th 2010 was just like any other day. I went to work, then a school meeting and then to practice with my daughter. I started feeling sick to my stomach, no big deal. I thought I must be getting a bug and off home we went. That’s the last thing I remember. Two hours later my husband was giving me CPR in our living room. At the hospital the Doctors were telling him I had less than a 5 percent chance of survival and asked if he wished to donate my organs. Five days later, I woke up. They told me I had cardiomyopathy and my heart was damaged beyond repair. A little over a year later I found myself on the heart transplant list and within two weeks had a new heart. I was able to go home after just six days! It all happened so fast and all started when I thought I had the flu. This kind of thing just doesn’t happen to a 48-year-old woman in excellent health. Not a day goes by that I don’t think about my young donor. I think even more about her mother who had to make a decision that affected so many people with her choice to donate. Her worst day was our best day. My husband had been asked to consider the same question just 14 months earlier that she had. Luckily, we had that conversation several times over the past 30 years so he knew my wishes and knew I would have wanted him to say “yes”. 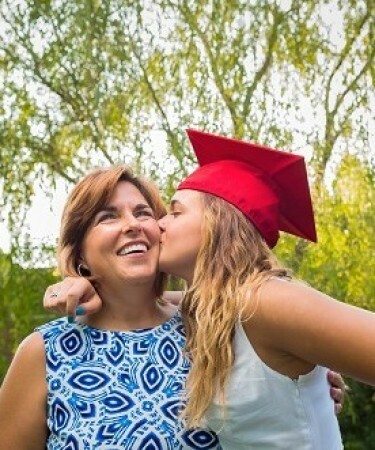 Because of her gift, I have been able to see my daughter graduate and begin Nursing School. We have returned to a normal life. It is our “new normal”, thanks to a selfless act of someone I have only exchanged letters with.